FrozenYogurtMix.com has all the equipment a frozen yogurt shop needs. Whether it is self serve frozen yogurt machines for a new outlet or a countertop yogurt maker for your existing location, we have the best yogurt machines for sale. How Much Do Frozen Yogurt Machines Cost? Where Can I Rent A Frozen Yogurt Machine? Should You Buy A Used Frozen Yogurt Machine? Our vendors provide you with the best yogurt machines at the best prices! You will find quality, warrantied yogurt machines and other equipment at discounted prices. Take your frozen yogurt business to the next level with the right equipment. A Touch of Innovation. 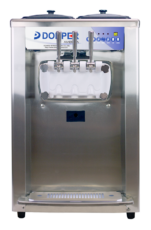 The world's first soft serve machine with a built-in 5" lcd touch-screen control display. 360° Service. Designed for serviceability, the 8000i has service access from the side, rear, or front of the machine. Go the Distance. Get up to 4x the production with the Argosy 8000i with scroll compressor technology. The BT7280 is the perfect, customer facing, countertop machine. Created for use in convenience stores and restaurants, this machine has the same capacity as its BH7480 counterpart, but has a smaller footprint. This machine is the optimal machine for any non-traditional soft serve concept. The BT7180 was designed for various applications. 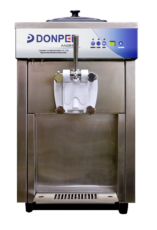 This countertop machine has the smallest equipment footprint in the Donper family. It is designed as a 115V unit so it can plug into most standard outlets. This machine is great for restaurants, schools, amusement parks, outdoor events or catering services. 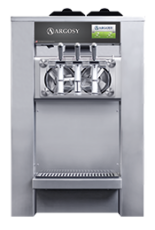 The BH7480 is the ideal machine for self-serve, frozen yogurt concepts. Through its eco-friendly and user-friendly design, the BH7480 simplifies the life of the machine operator. From start up to clean up, this machine runs smooth throughout the day, offering patrons a creamy and consistent product with every serving. Before you make a purchase it’s important to know the key factors when making your decision. We’ve compiled a list of helpful articles to give you the background necessary in order to know the basics. How Much Do Quality Frozen Yogurt Machines Cost? How Does Selecting a Machine Affect Your Business and Business Planning? How Many Yogurt Machines Do You Need? Who Will Support Your Machine if it Needs Repair? What Are Common Repair Costs? 4 Factors Leading to FroYo Popularity! Starting Frozen a Yogurt Shop? Know Your Two Highest Costs. What’s the Difference Between a Commercial Ice Cream Maker and a Commercial Soft Serve / Frozen Yogurt Machine?